Guys today I have a very special recipe for you. 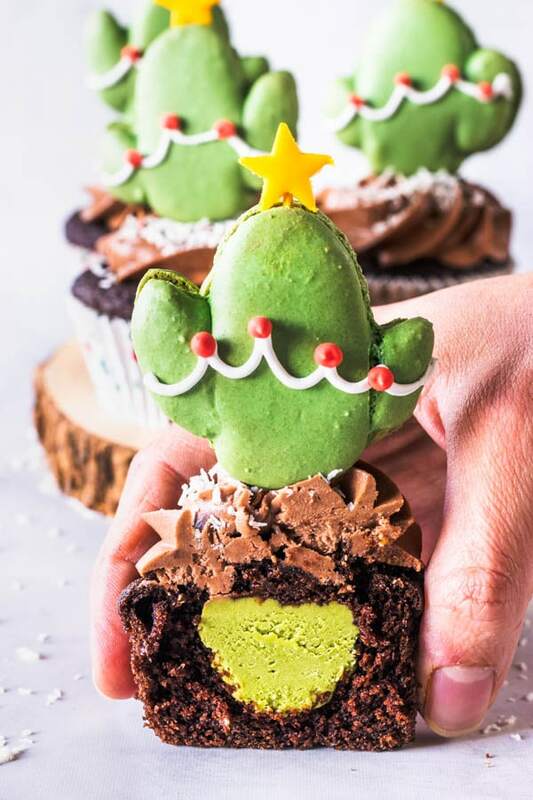 I present my Chocolate Matcha Cupcakes with Matcha Cactus Macarons. 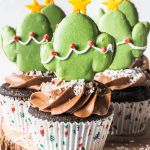 My very own Christmas Cupcakes to celebrate this season! This is a long post. And a very long recipe. Don’t shy away. It took me just a couple of days making these, from waiting for the royal icing that I used to decorate the macarons to dry, and stuff like that. But I will warn you, this is a labor of love all the way. 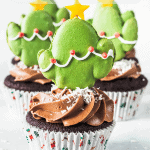 First question: Why Cactus Macarons for Christmas? Well, that’s what my husband asked me anyway. But he was convinced after he saw the final results. 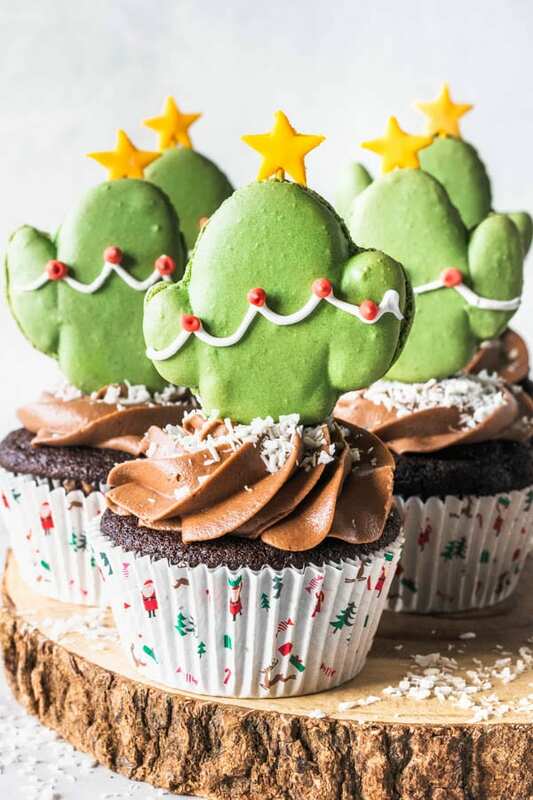 During my labor of love and time making these Cupcakes, I don’t think he could quite comprehend why I was going with something unusual like a cactus instead of a little pine tree. And the answer is: because pine trees for Christmas tree are too obvious. I don’t care for obvious. 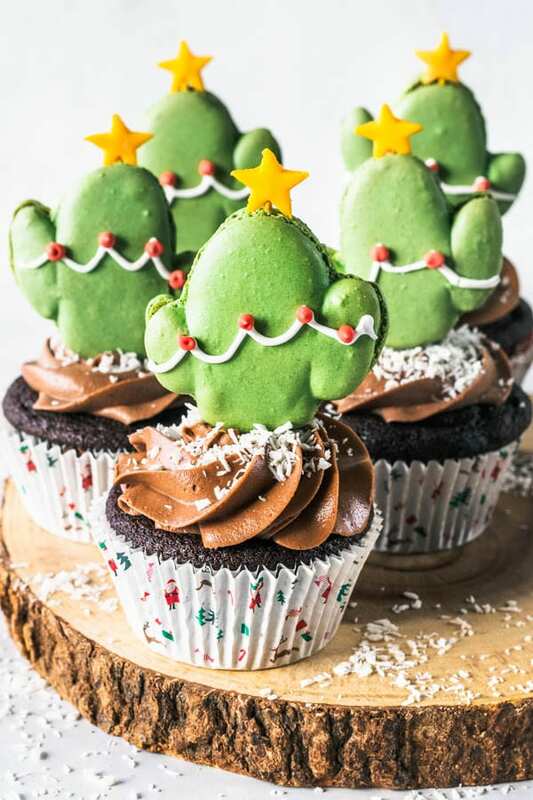 Now Cactus Macarons for Christmas trees, that’s something you don’t see everyday. 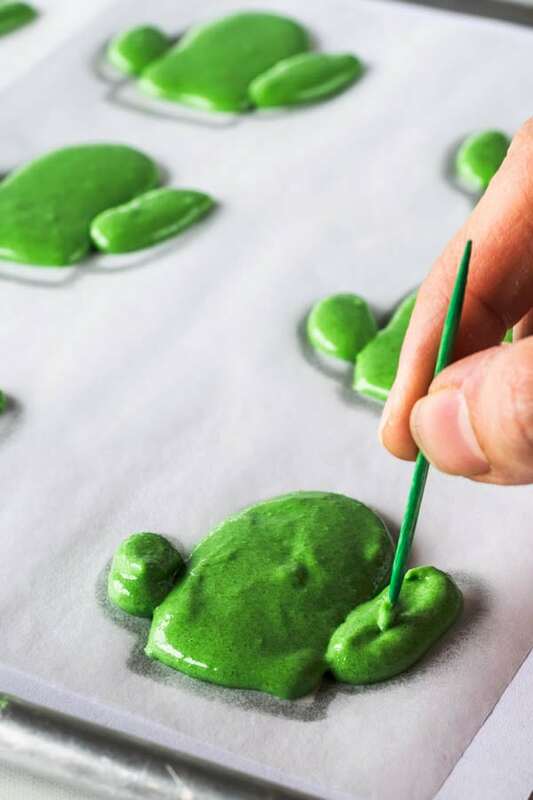 So much so that I couldn’t even find a template online to make the macaron shape. Which means I had to create my own. The download of the pdf with the template is available to you down below in the post, if you want to make your own Cactus Macarons. Alright, enough with the introductions, let’s get to work, folks. About the macarons. 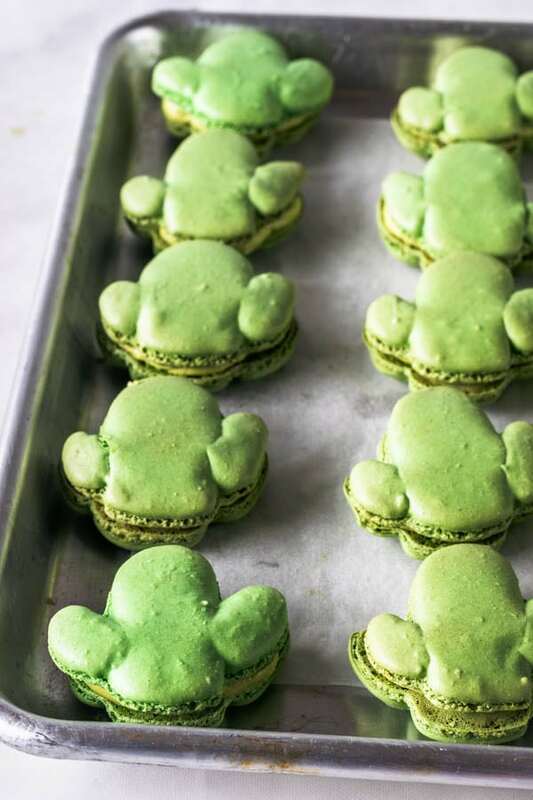 My Matcha Macarons recipe is one of my most visited pages here at P&T. And that post englobes a lot of tips on how to make macarons. Besides that, I have many other posts with awesome tips about making macarons, check out my Macarons recipe section. So here I will just give you some tips on how to make the shape of the cactus, etc. 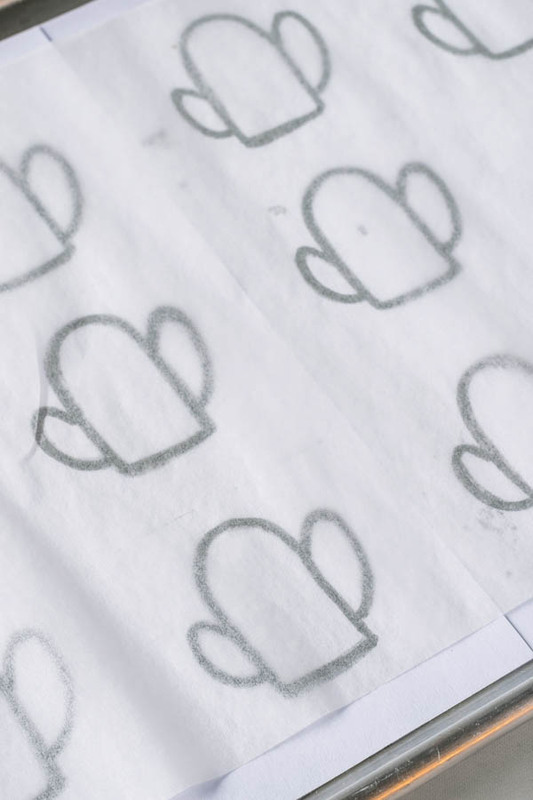 First, here are the templates for the cactus macarons. 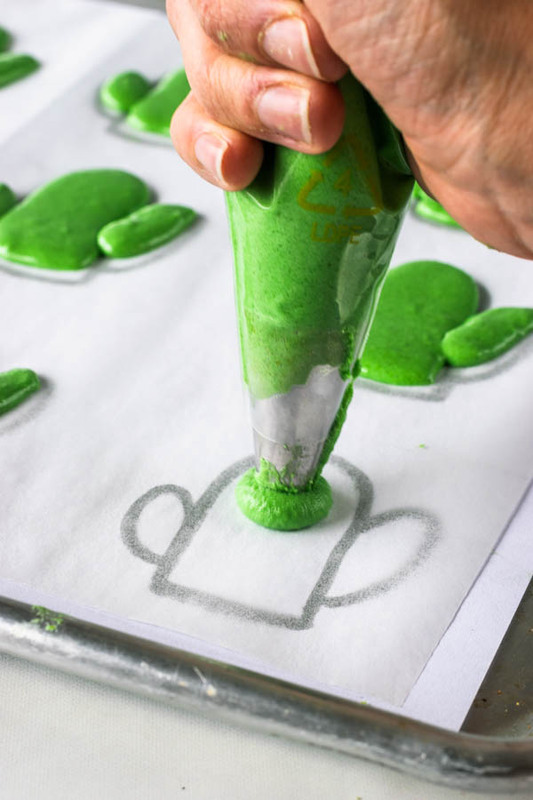 You will need two different templates, because you will need to make them mirrored so you’ll be able to make the cactus macaron sandwiches. 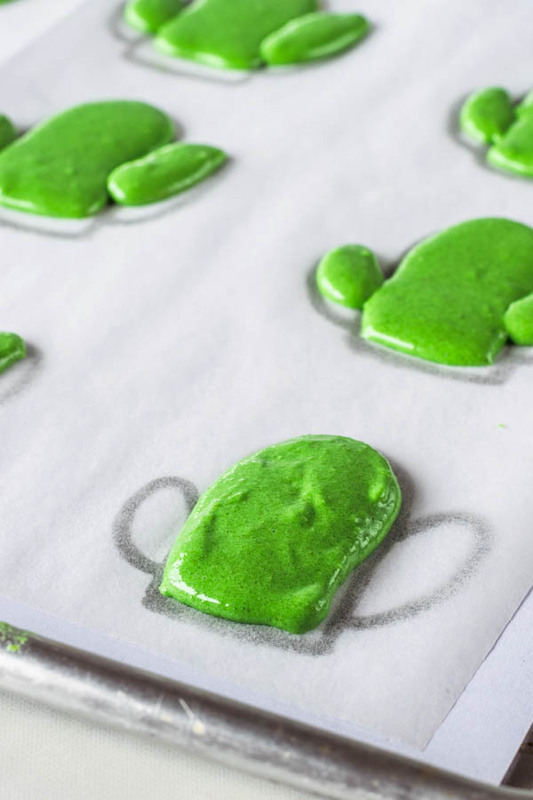 When you print your templates, you can place them under the parchment paper like this. 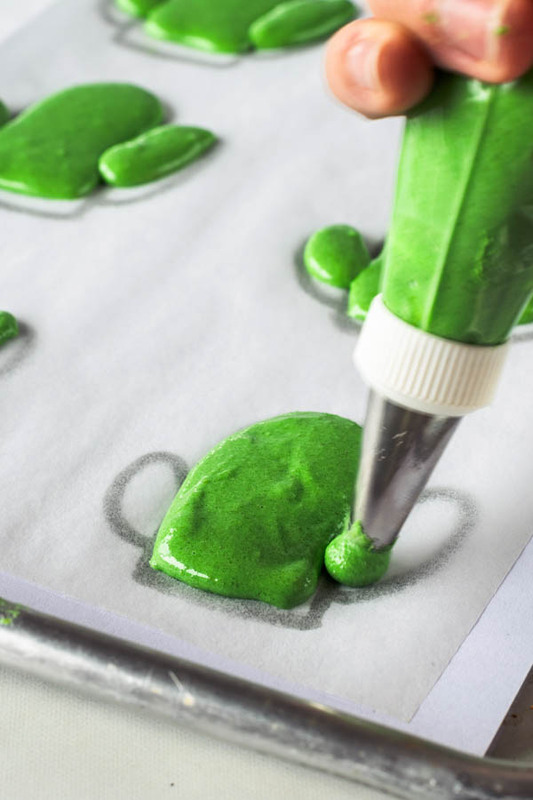 We will be using two different tips to pipe the macaron batter onto the parchment. Wilton No. 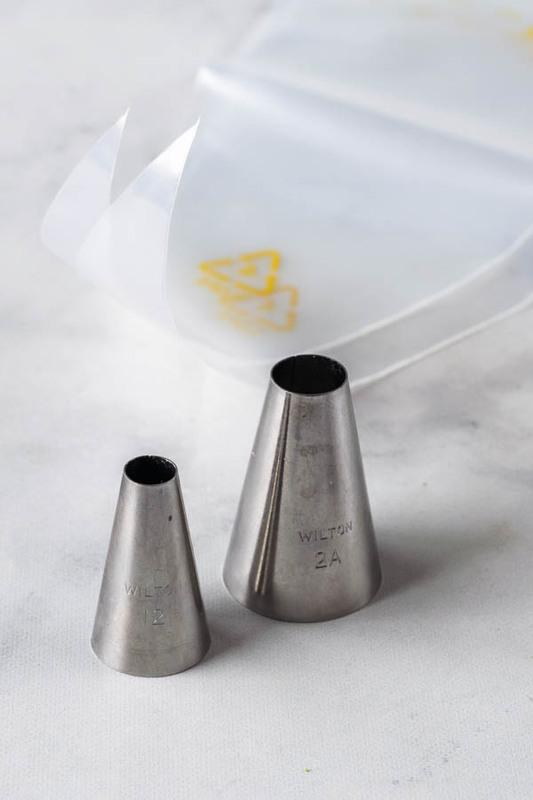 2A and Wilton Piping Tip 12 . The large 2A will be used for the body of the cactus and the smaller one will be used for the arms. So go ahead and line your bags with those tips. 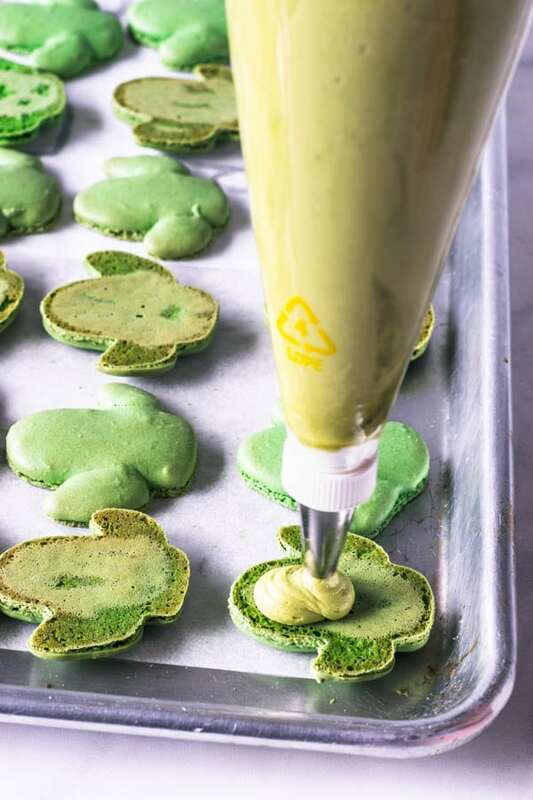 When you divide the batter before piping, simply place a little bit more batter in the bag with the large 2A tip, because you will use a bit more batter for the body of the cactus macaron. 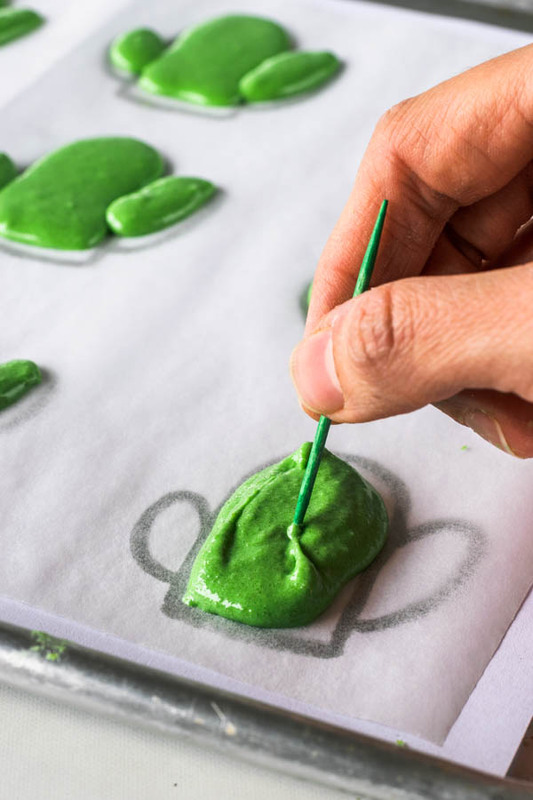 After you got your batter to the perfect consistency (check tips down below on the recipe area), you may start piping. We will start piping the body first. Pipe some batter on the area that’s correspondent to the body. And now you will use a toothpick to smooth the batter out and spread it out to the edges. Might take a couple of macarons to get this right. The batter needs to be the right consistency, or this won’t work very well and you will end up with a very bumpy macaron. 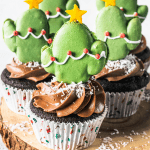 What I did is that after each cactus body I piped, I smoothed it out with the toothpick, if you pipe too many, the batter will quickly start to dry out and it will be impossible to get it to spread out to the edges. It is more time consuming going one by one, but trust me on this one. After I’ve piped all the bodies of one baking sheet, I piped the arms. HELPFUL TIP: You want to make sure the batter that’s not being used is covered at all times. So after you are done making the batter, spoon it inside your bags, and close the bags at the ends, so the batter isn’t exposed, because it will take a while to pipe and smooth out all macarons. Use the smaller tip to pipe the arms, I piped a small dollop of batter and then used the toothpick to smooth it out to the edges. Now, after this major labor of love, you can let your babies rest while your oven pre-heats. 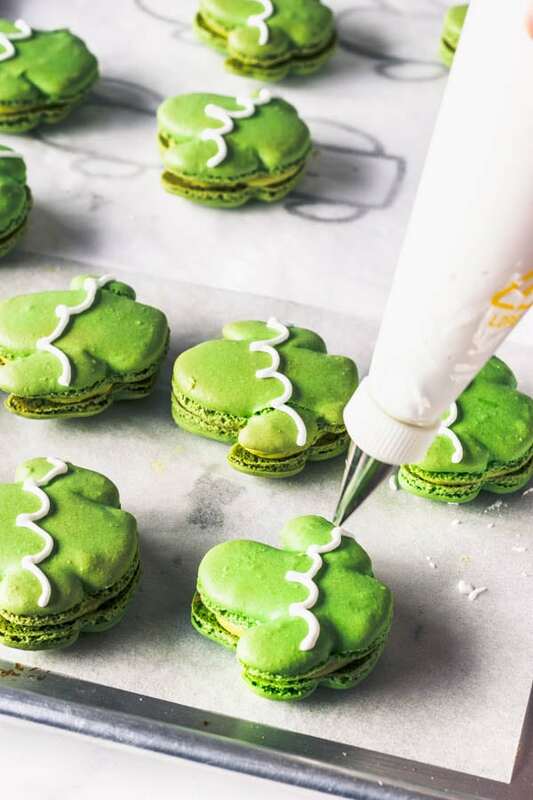 After baking, cooling, making the Matcha Buttercream, you may proceed with filling the macarons. 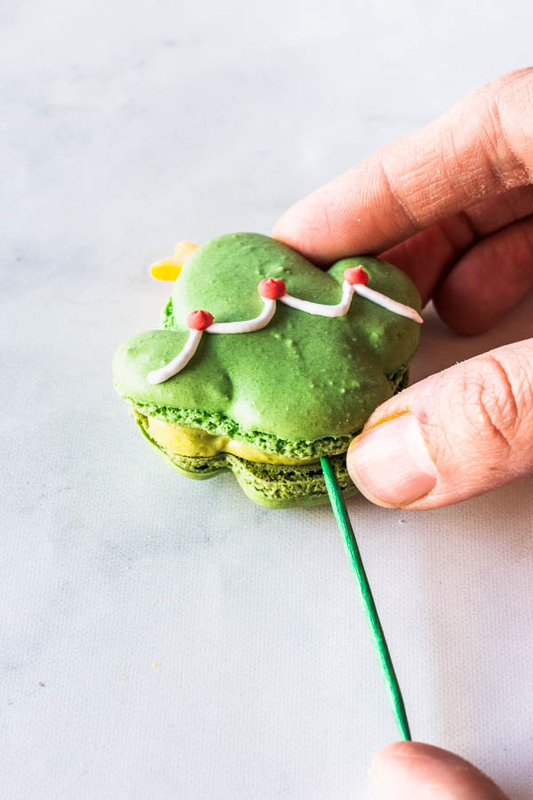 And then, place the other half on top of the Cactus Macarons. 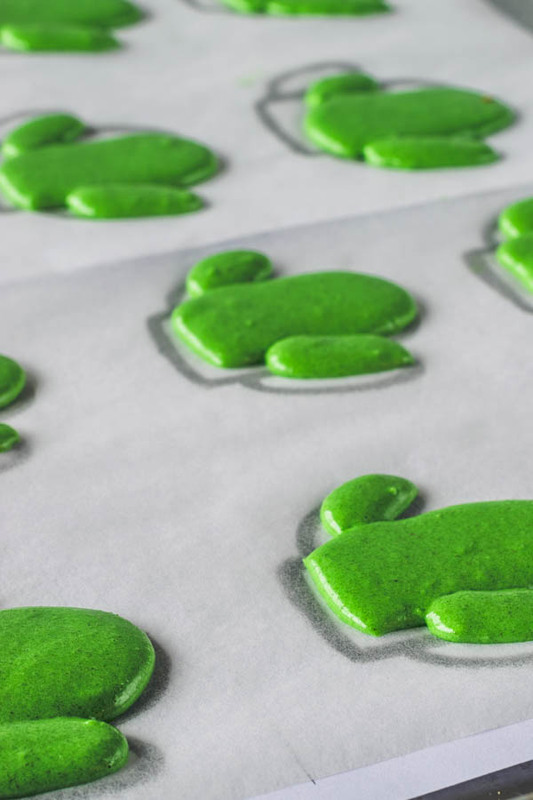 Some of my cactus macarons ended up with some air bubbles, because I didn’t tap my trays enough during the process of piping the batter. 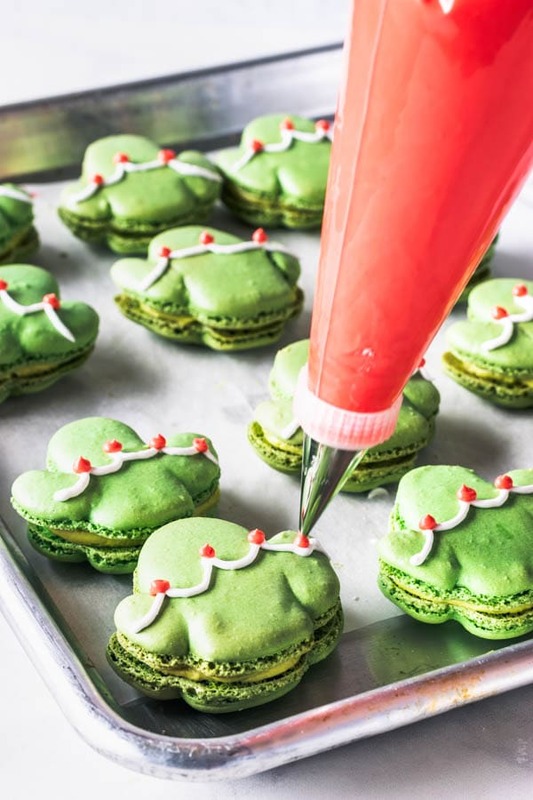 HELPFUL TIP: You might want to slam the trays against the counter a few times in between piping, since piping takes so long, and macarons might start to dry on the surface before you are done piping all the cactus in one tray, and then when you finally do tap the tray against the counter, the air bubbles will already be trapped inside. 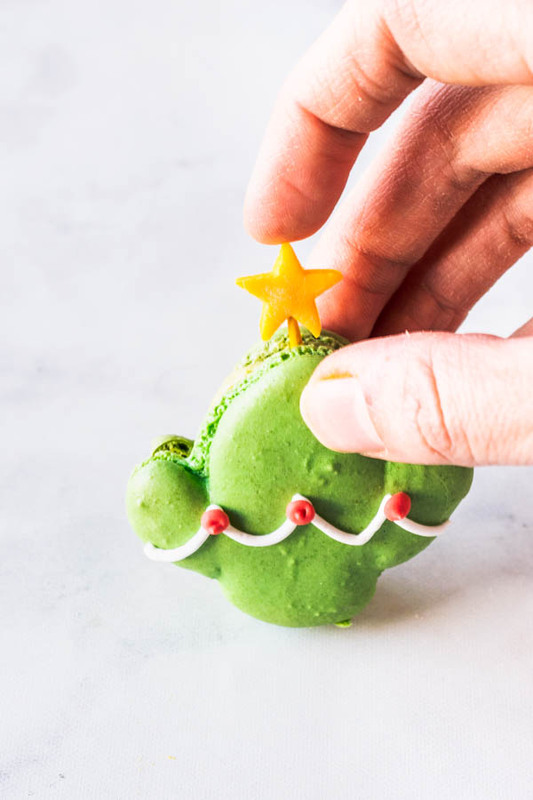 Now let’s talk about the beautiful Christmas decoration I made for my macarons. I used the Royal Icing recipe by Sally’s Baking Addiction to make the white ruffles and the pink (reddish?) Christmas balls. After piping the ruffles, I let them dry slightly and then piped the Christmas balls. At this point, I let the macarons dry before proceeding, otherwise I would ruin the royal icing decoration while managing the macarons. Anyway, once the decoration is a bit dry, you may proceed with the next step. 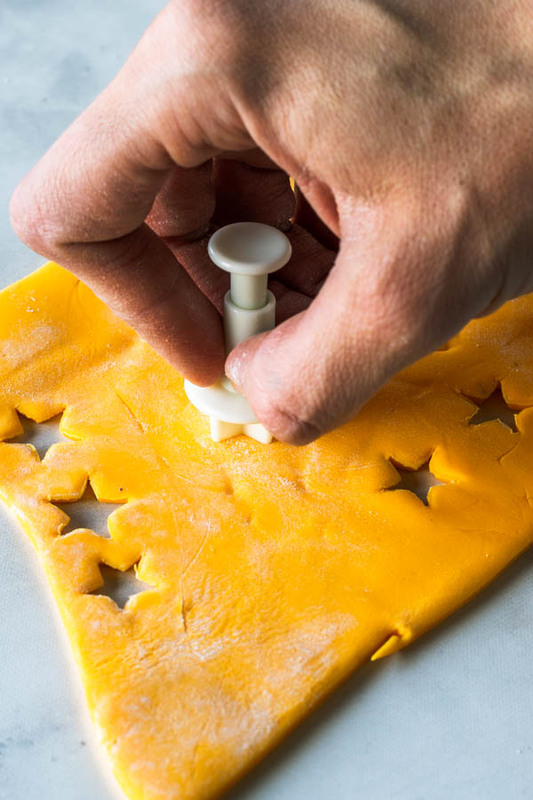 You will need toothpicks, a piece of yellow fondant, and a little star cutter. I used the small star cutter in this kit. As soon as you cut out your stars, you can proceed with placing them in the toothpicks. You don’t want the stars to get hard on you, or you won’t be able to stick the toothpick through them. 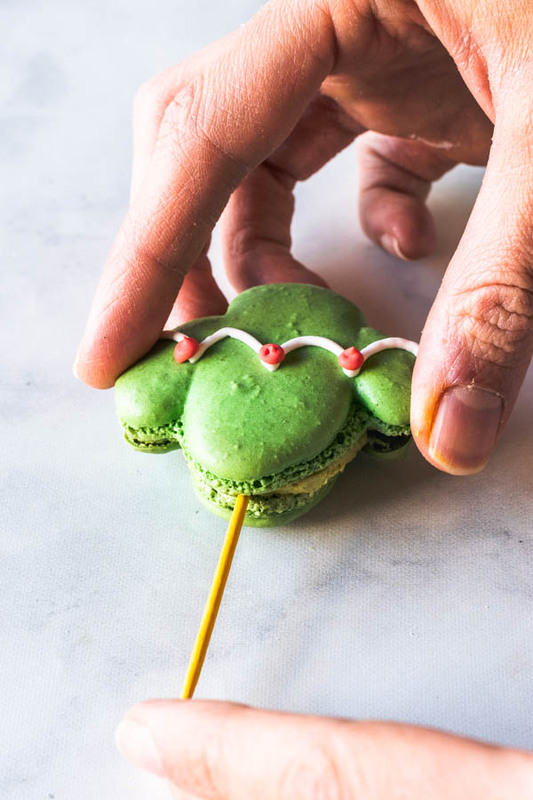 First, place the toothpick in the macaron, on the top, through the middle, like this. 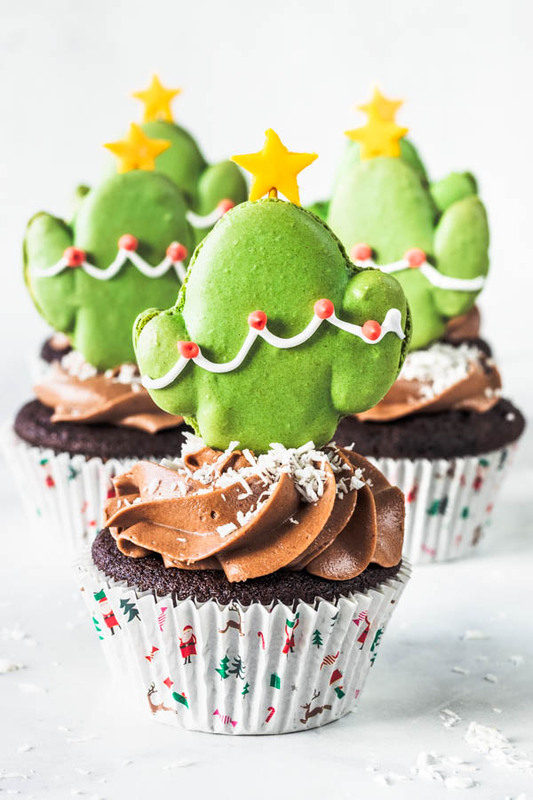 And then you may carefully place the star on top of the cactus macaron. 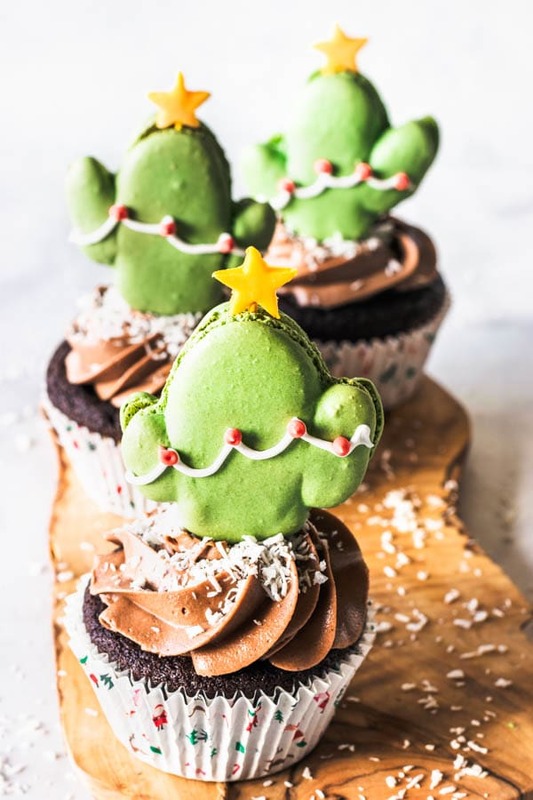 Now, place a toothpick on the bottom of the macaron, so the cactus macaron can be places safely on top of the cupcake, without the risk of falling. 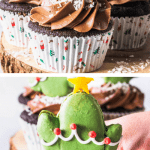 It’s a lot of steps, but if you are the type that likes to have great baking projects, then this one is for you, my friend. And tell me they aren’t worth it. To me they were, times 10. Now, about the filling, I did fill my cupcakes with the matcha buttercream as well. 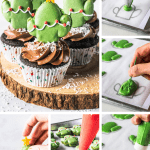 If you don’t want to fill your cupcakes with the matcha buttercream, you can leave it plain, but reduce the amount of buttercream in the recipe, you can go with the amounts used in the original Matcha Macarons recipe. Thank you so much for reading my blog post, which is probably my biggest post so far. 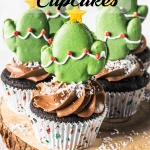 Please find attached the links to the cactus macaron templates up above on the post. Any questions about any of my recipes, always feel free to drop a comment down below, or message me on instagram or even on my email camila@piesandtacos.com. 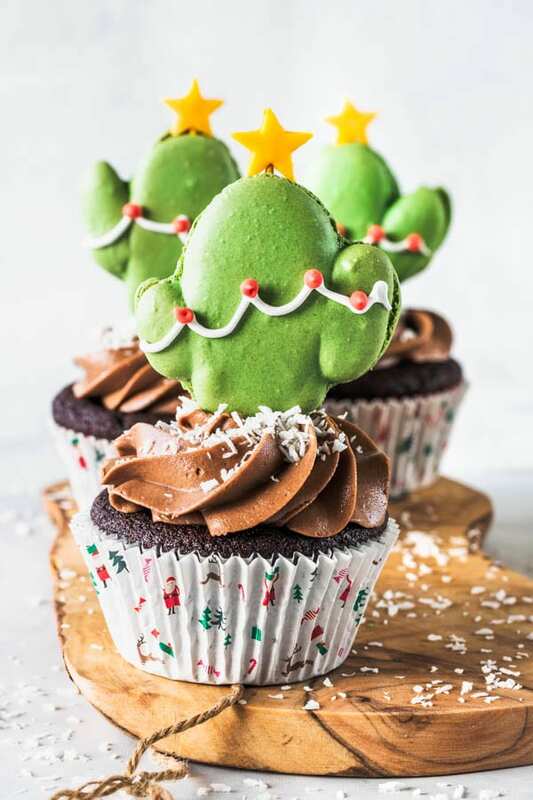 Have a lovely day and I hope you enjoyed my Chocolate Matcha Cupcakes with Matcha Cactus Macarons, Christmas edition. 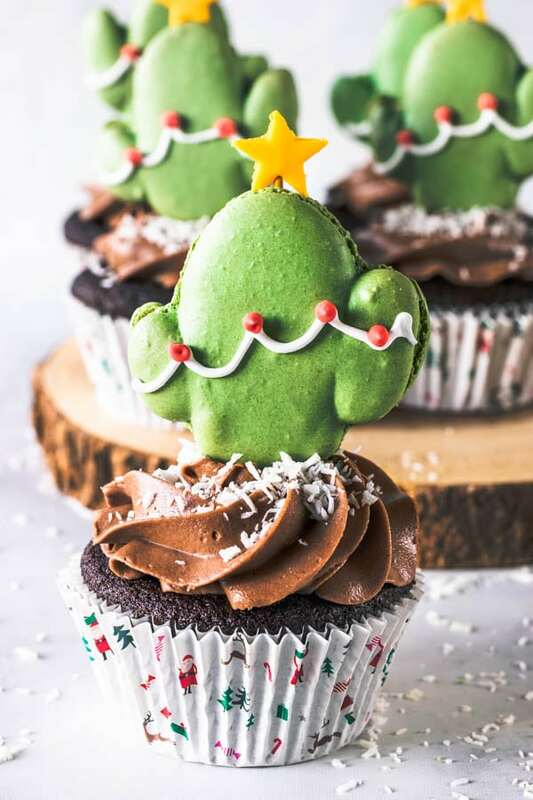 These are my Christmas Matcha Cupcakes with cute little Cactus Matcha Macarons on top, made into Christmas trees. What a great detailed instructional post! So much great information here!